The Unbelievable Truth is a BBC Radio 4 programme in which panellists have to give short talks during which they have to smuggle some lies and some truth past their fellow contestants. Their fellow panellists buzz when they think the speaker has lied. 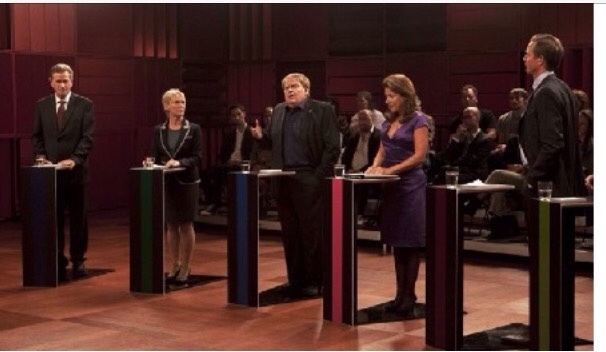 So far, in the 2015 UK Election, we have had two debates: Ed Miliband v David Cameron and a seven leaders debate, Borgen style. Next, I suggest we have an Unbelievable Truth debate, and let's see who can smuggle the most ridiculous soundbite lies through. The fact-checking charity FullFact.org had a posting testing ten of the facts given in the seven way leaders debate- stating that some were true, whilst others false. Their list didn't comment on one 'fact' David Cameron cited at least once (and if I recall correctly, twice) that rather than raise taxes, as Labour want to do, they can stop the deficit by merely saving £1 in every £100 that Government spends. He then makes the throwaway comment that any business can do this. Now, in order to try not to get lost in figures- it all depends which fiscal year you take, which estimate, revision or forecast, I will use round(ish) numbers. The UK Budget deficit is around £75bn on spending of £750bn (taxes and other income being about £675bn. (Googling, I also found £84bn and £90bn as the deficit: let's be charitable and stick with the lowest, £75bn. Government spending is £750bn, so a 1% cut saves £8bn. So on a one year basis, no chance: the deficit will still be about £70bn; and on a two year basis- as per the FT article- again, no chance- the deficit will be about £50bn. Even on a five year basis, the claim is incorrect. I will be interested to see if David Cameron repeats the claim, and whether his opponents ever pick up on its falseness. Buzzers, please.